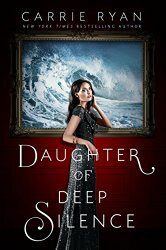 I love a good revenge thriller so I was really eager to devour DAUGHTER OF DEEP SILENCE. It was quite engrossing though I'll admit I had a hard time getting into it for almost the first hundred pages. I can't talk a lot about the actual plot or even Frances without spoiling things that I think you should get to enjoy as you read it but I will say that there's an awful lot of build up for such a weak ending. It reminded me a little bit of the show Revenge and also The Lying Game, neither of which I could watch more than a few episodes of in their first seasons. So if you enjoyed either or both you might really enjoy DODS. It had some plot holes that I felt needed to be plugged better but if you can suspend a certain amount of disbelief to enjoy the revenge plot I think you'll enjoy it. While I didn't love it and found the ending a big disappointment I think this would make a great stand alone beach read.